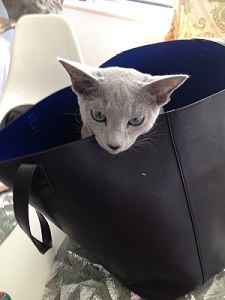 The Mansur Gavriel girls sent me one of their fabulous totes, but it’s turning out to be more of a gift for my kitten, Peter! When he’s not inside, I’m carrying this simply chic leather bag to and from meetings. In fact, I loved it so much that I went to order another only to find that Mansur Gavriel is hot, hot, hot! I could barely get my hands on their bucket bag. Keep up the beautiful designs, ladies! They’re perfect.